Matt graduated with an MBA from Oklahoma State University in 2014 and a B.A. in Advertising from Brigham Young University in 2009. 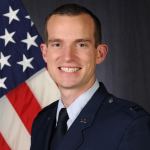 As a Captain and a Space Operations Officer in the Air Force, Matt supervised launch operations for DoD satellites and ballistic missile tests, and trained new officers in orbital mechanics and space operations. Matt is currently attending Harvard Law School as part of the Class of 2019.